The new IMX342 from Sony offers first-class image quality with 31 megapixels. SVS-Vistek complements this sensor with powerful interfaces such as CXP or 10GigE, making it the fastest IMX342 camera on the market today. The new Sony IMX342 sensor sets standards in image quality even in the 31 megapixel class. The values for dynamic range, SNR, low light sensitivity and flatness are excellent and move on the high level that one expects from the Sony Pregius 2 sensors with 3.45µm pixel size. With 4 CoaXPress channels the hr342*CX delivers a maximum data rate of 35.4 fps and is the fastest 31 megapixel camera with IMX342 sensor on the market today. CoaXPress offers long thin data lines, but always requires a frame grabber in the host camera connection. 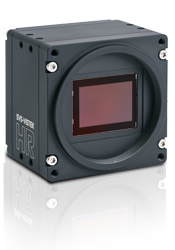 The hr342*XGE with 10GigE interface reaches a maximum data rate of 31.4 fps. 10GigE is rapidly gaining popularity in the machine vision sector, offering both long data lines and networking via an IP network structure. A frame grabber is not necessary.